Our feet carry us every day, but they are often not cared for as much as they could be, and we can sometimes neglect the care of our feet. But even though they are often out of sight, they shouldn’t be out of mind. This can be a detriment to the beauty and well-being of your feet, but how can you help keep your feet healthy and beautiful? A key part of tackling this, is understanding the hard skin on your feet and why it is important to take care of them as part of your regular routine. What is the hard skin on my feet? Hard skin can look different for different people, as skin hardness is a scale, rather than a condition that you do or do not have. Rough patches of hard skin that are usually yellowish in color can often occur around the heel or on the ball of the foot. This skin is usually less sensitive to the touch than the surrounding skin and is quite thick. These areas of skin, referred to as calluses, are less defined than corns, which are often softer but have similar causes. Hard skin develops when the skin rubs against something (such as a tight shoe), this leads to calluses forming on the bony parts of your foot which take most of the weight as you walk. Walking barefoot or repeated heavy pressure such as running can speed up the formation of calluses. It is for this reason that athletes are particularly susceptible to hard skin on the feet. 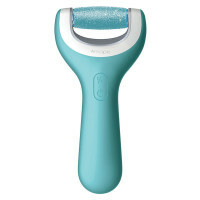 Removing hard skin is easy with one of the Amopé Pedi Perfect™ products. These can be easily tailored to your individual needs, whether you have very hard skin or are taking the time to prevent future build-up of hard skin areas on your feet. The Amopé Pedi Perfect™ Electric Foot File with Diamond Crystals can be customized to fit your specific needs with different roller heads, making sure that your feet are the smoothest that they can be. How can I make sure I avoid hard skin? Respond to painful feet as soon as possible, this can indicate future problems. Dry your feet properly after showering and bathing to ensure your skin remains healthy and beautiful. Find a daily foot care routine that works for you. With minimal time and effort each day, your feet could always look and feel beautiful.